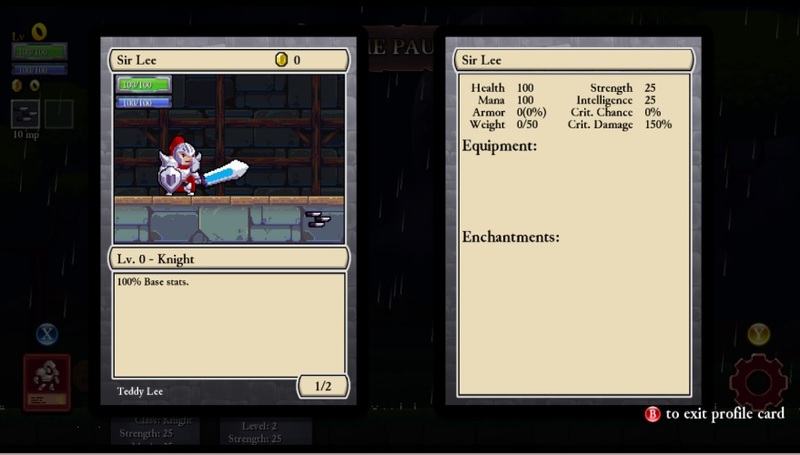 Ever since I finished my initial playthrough of Rogue Legacy, I wanted to test out the individual classes in more detail. This game has eight different classes, along with a secret hidden ninth class, and many of them play in extremely different fashions. The casting classes in particular rely on magic damage from spells and need to be built in a very different fashion from the normal brusiers in order to maximize their effectiveness. I decided that I would go back to the start of the game (having to uninstall and reinstall, unfortunately, since there are no extra save files for this game) and play only as one character class at a time. Because you do not get to choose your class in this game, only picking between a set of three randomized heirs after each death, I would have to murder off any non-designated heir when the desired class failed to show up. However, by sticking with a single class, I could set up their stats and their gear specifically to match the strengths of that job, and experience each of their gameplay in turn. Then I could compare how they fared afterwards and see what worked and what didn't work, much like my Final Fantasy solo characters. Overall, it seemed like it would be a lot of fun. I started of course with the Paladin class, the most basic of all the jobs in this game. The Paladin (the upgraded version of the Knight) is arguably the strongest class as well as the most simple, getting 100% value on all base stats, whereas most other jobs have major penalties in some area. 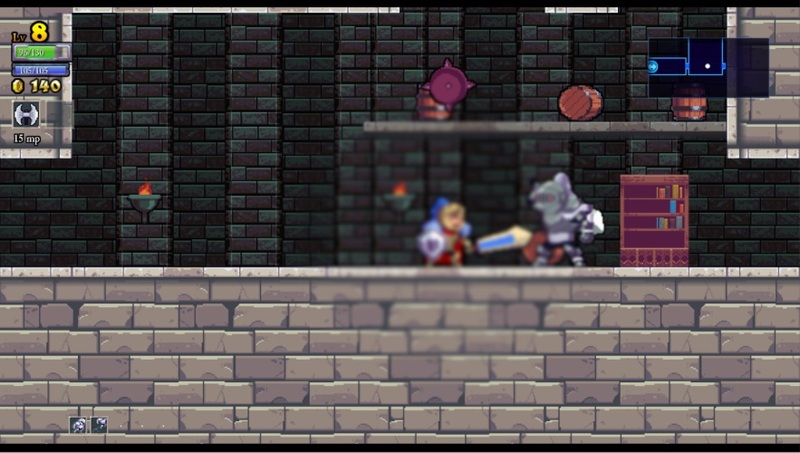 Being good in all areas is not a bad thing in Rogue Legacy. The unique ability of the Paladin is the use of a shield; holding down the special key negates all damage at the cost of 25 magic points. There is a very short casting animation as your character pulls out his or her shield, but otherwise there are no restictions on this ability, and it can be used in mid air or just before taking damage in nearly all circumstances. Intelligent use of the shield is an extremely powerful tool for the Paladin, and I hoped to master its use through the course of multiple characters. How many poor heirs would have to die before a Paladin finally emerges from the dungeon triumphant? Let's find out. 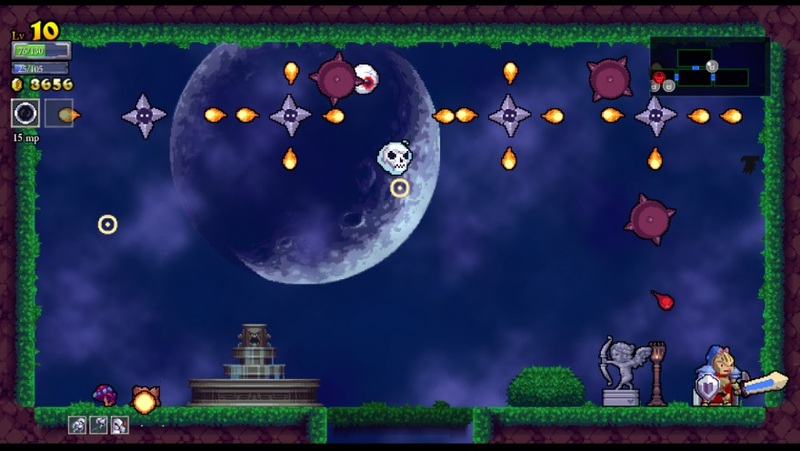 Really tough playing with no double jump, no dash, and no vampirism. This poor sap didn't even have the upgraded Paladin class and the shield ability yet. Didn't get very far and died because I forgot about the lack of a second jump. Endomorph (knock back). This was a much better run, picking up a lot of gold and even the first piece of equipment (Squire Chestplate). I cleared the entire castle portion and ventured into the forest, with the help of a conveniently located fountain. Really need to get some Vampirism stuff for sustain. The unlocks mostly went into getting a basic set of equipment (apparently my Paladin was a full Squire at this point, outfitted with the sword, helm, chestplate, and limbs) and basic runes for double jump and dash. Farsighted, Endomorph. The inability to see things close up was super annoying, but this was the only Paladin available. I got off to a rough start taking the picture above, losing 40 health in the process, then hung on for as long as possible. This character managed to find Charon's Obol, although that wasn't too useful here. I was down to 4 health at one point, then built it all the way back up to 50 health through raiding the chicken drops outside boss rooms and the entry to the forest/tower. 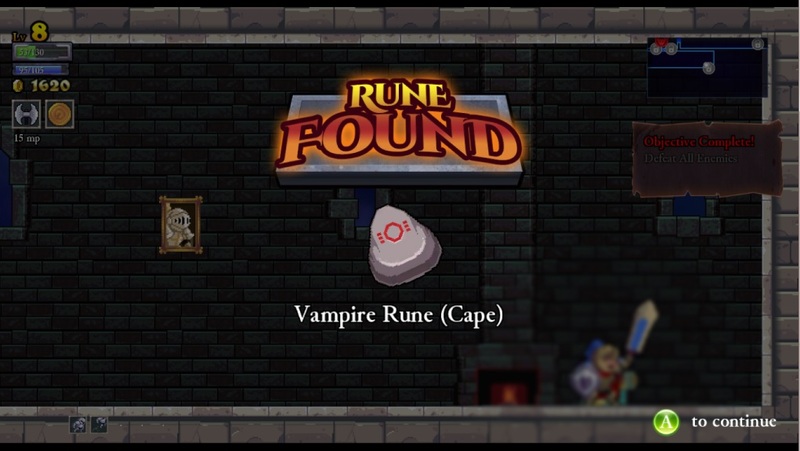 This was a very big deal, as eventually this run managed to find a Vampire Rune in my first fairy chest. Excellent! So what started as a rough run turned into a very productive outing. With the unlocks, I immediately grabbed that Vampire Rune and then took the utility choice of extra gold gain. I nearly managed to full clear the forest before dying in the final corner of the area. Pretty nice run for such a low level character. As usual, most of the gold from this run went into using the equipment found in all those chests. I actually should have bought another Gold Gain Up, since I had enough to take it, and that's the most useful longterm utility skill to grab early. Still unlocking the basic skill tree at this point. Alektorophobia (fear of chickens), fairly harmless trait. I actually had two of those zombie chickens drop in the very first room, what a waste, heh. A brutal room full of enemies nearly killed my character, but yielded up another Vampire Rune (Helmet), very nice indeed. Limped out of there with 18 HP. I worked it back up nearly to full at one point, only to fall in the forest later. Not as good as the previous run. I had just enough gold for the second Potion Up skill, and took that over the other choices. Baldness, Dwarfism. I love the tiny characters, not only because they can run through the tiny passages, but because their hit box is so very small. This is a game about avoiding damage, not dealing it out. This run ended in a failure when I tried to take on one of the minibosses, the two floating mages. It ended poorly. Used the minimal gold to unlock the two critical strike skills, don't plan on doing much with them for this class. I actually full cleared both the castle and forest for the first time with this run, and got decently far into the tower. I spent the money from this run on increasing Gold Gain to level 2, then upgraded equipment to the new Knight stuff, along with more equipment weight. There was just enough left over to unlock the Haggle skill with Charon (needed for other unlocks) and pick up a final Health upgrade. I was now using all Knight gear, and had only 20 gold left over after spending. This Paladin had P.A.D. (anti-floor spike ability). I decided to take a shot at the first boss, in part because I had this ability. While exploring the castle, I also found a Haste Rune, although I was unlikely to use it very much. The battle with Khidr went fabulously well, as I was able to win without taking even a single point of damage! The PAD ability definitely helped here, allowing my Paladin to stand in the bottom left corner with impunity throughout the fight. The rewards for winning were about 2000 gold and +5 health, +1 Strength, +1 Magic Damage. Deep in the back end of the forest, I also found the Silver Chestplate, another equipment upgrade. I had hoped to try and take on the second boss, but this character met an ignominious end while trying to clear out the rest of the forest. Upgrades went into another Gold Gain, unlocking the Silver Chestplate and enough Equipment to use it, and picking the Hokage class to open up the Armor Up skill for future use. Dextrocardia (HP/MP pools swapped), Hypochondriac (damage taken numbers pop up enormous size). These random character traits were not the best, having 105 health instead of 145 wasn't my idea of fun. I found the Blood Chestplate early on, no plans to use it though. The stat penalties are too severe. I found myself knocked down to 2 HP at one point and rebuilt my health all the way back up to full again. Those moment when you're one hit from death do get the blood flowing in this game. Then I lost it all and died in the first room of the forest, brutally tough traps there but still poor play. Blargh. Not enough gold to get any utility upgrades, so they went into cheaper "real" stats instead. Dwarfism, P.A.D. 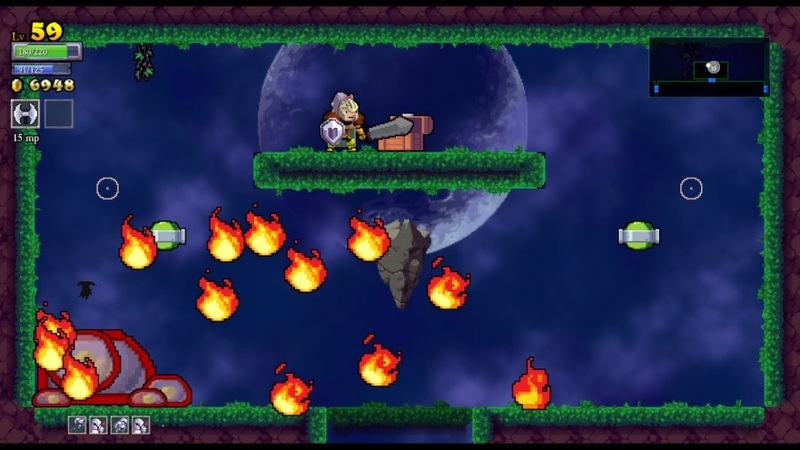 I mentioned before how I love the little dwarf guys with their tiny hit boxes. This character immediately made himself useful by racing through a room to grab a Curse Rune, not sure if I'll use that or not. The Knight Cape and the Silver Bracers dropped later on in the forest. Then the Sage Bracers appeared in a chest next to the boss door in the forest, unfortunately not that useful for a Paladin. This was followed by the Silver Helm in the very chest next to it, much more interesting. Four different pieces of equipment from one run, all in the forest! I tried to kill Alexander (the second boss) at the end of this run, but it went poorly and I didn't come close to killing him. Ah well. Need some more levels. The dwarfism actually seemed to make this battle harder, tough to get close enough to hit the boss without taking a hit in turn. All of the money from this run went into the fourth Gold Gain increase. Need 10k now for the final one. Baldness, Stereo Blindness. Neither trait very interesting. Found the Blood Cape early on, none of those early Blood items feel too good to me, since they all carry a health penalty. Better to get Vampirism from elsewhere. I fought a lengthy and deadly engagement with the duo floating mages miniboss, which cost me most of my health and all of my mana, resulting in a Blood Helm drop. Hmmm, hoped for better stuff there. Instead of trying to run a boss battle, I used this character to clear out all of the castle and forest, and most of the tower. This turned into my first 10k gold character and worked out nicely. Finished with the passive gold gain after only 11 characters, better than I expected. The rest of the gold went into unlocking new Silver gear and having enough equipment ranks to use it. My Paladin was dressed almost entirely in Silver garb at this point. Endomorph, Gay. One nice thing about this game's design is that the "gay" trait conveys no gameplay advantages or disadvantages. The castle portion was surprisingly difficult on this run, knocking me all the way down to 4 HP, and I never really recovered from that despite making use of a convenient fountain refill. I couldn't ever seem to get up near full health, maybe because of the large Endomorph character model. I scored out with a fairly mediocre 7k run, turning the gold into a third Potion Up upgrade (I value them heavily) and the rest into actual stat gains. No new equipment or runes to use here. Gigantism, even larger character model than Endomorph. Hard to dodge anything. On the plus side, you do get a humongous sword! I found a Vault Rune in the castle early on, and Ranger Bracers in the tower later. 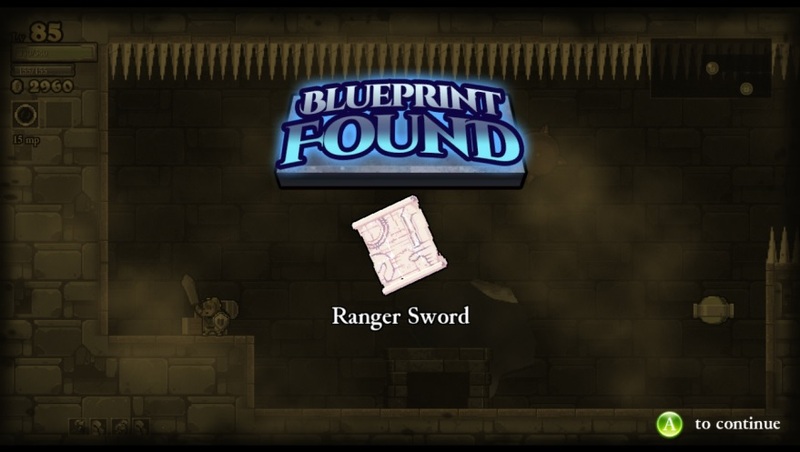 This was the first piece of Ranger gear to drop. Died trying to clear out more of the tower, couldn't dodge a room full of projectiles. I had exactly 1 gold left over after upgrading Potion Up a fourth time and taking an Attack upgrade. Tunnel Vision, Stereo Blind. I found a Sprint Rune and a Grace Rune early in the castle this time, both of them in easily obtained fairy chests. Then a third fairy chest turned up a Siphon Rune in the forest. Those things can range from simple to completely impossible. Died once again in the tower, I had a good run but never could seem to refill health bar after taking damage. I think that I need more Vampirism to sustain through routine damage. Last Potion Up unlock was 8180 gold, and I had 8206 gold. Very nice timing. With all Gold Gain and Potion upgrades, from this point it's time to start building up my Paladin main stats. That must be extremely rare from a random chest. This looked like a disastrous run as I was all out of resources and about to die in the forest, only to find a fountain and two rapid chicken drops thereafter. This game can turn in your favor, or against you, in a real hurry. That allowed me to full clear the castle, forest, and much of the tower, picking up a Sky Rune on a 10k gold run in the process. With no utility stuff left to get, this money went into major upgrades to my Paladins. Stereo Blind, Dextrocardia. Because I only had 125 HP and 220 MP, instead of the other way around, I simply tried to clear as much as possible with this character. Not a good character for attempting bosses. I did pick up a Sprint Rune, which was noteworthy as the first Chestplate rune I found all game. Been running nothing in that slot (and the Cape slot!) this whole time. I also picked up the Ranger Chestplate and Ranger Cape in the tower, making this a worthwhile run despite the Dextrocardia penalty. Later, I found the Guardian Bracers, my first piece of Guardian equipment, deep inside the tower. Died in the forest trying to get another fairy chest, just not enough health to work with. I was very happy to get 11k from this character. The money from this run went into using the equipment and rune goodies picked up along the way. A Sprint Rune in the Chestplate slot let me change the Sword slot to a Vault Rune, and then change the Helm slot to a Vampirism Rune. Net effect was to keep the double jump and dash while going from +1 to +2 Vampirism (4 HP per kill). Still nothing to pick in the Bracers Rune slot except a Grace Rune, which I refuse to use. I changed my equipment to a Ranger Chestplate, Guardian Limbs, and a Ranger Cape. This increased Armor by 31, from a starting value of 49 up to 80. The difference was very noticeable! All of that also needed a ton of Equip Up purchases, and that cleaned out all of the remaining gold. Only 45g left after this spending spree. The only trait on this character was the non-effect Gay. This seemed like a good time to go for the second boss, especially with all of the extra Armor from my new gear. I actually played very poorly in the beginning part of this run, but the extra Vampirism erased those mistakes over time. Picked up a Curse Rune in the forest, could have been something more useful.I had a fun fight with the Bloopersaurus Rex miniboss, essentially a smaller version of the fourth boss. By staying up on the little platform at the top of the room, I was able to remain mostly safe here. I planned to fight Alexander with this character all along and did so, barely winning a close fight. Taking the picture here nearly got me killed, heh. The reward for winning was a lot of gold along with health, equipment weight, and magic damage upgrades. 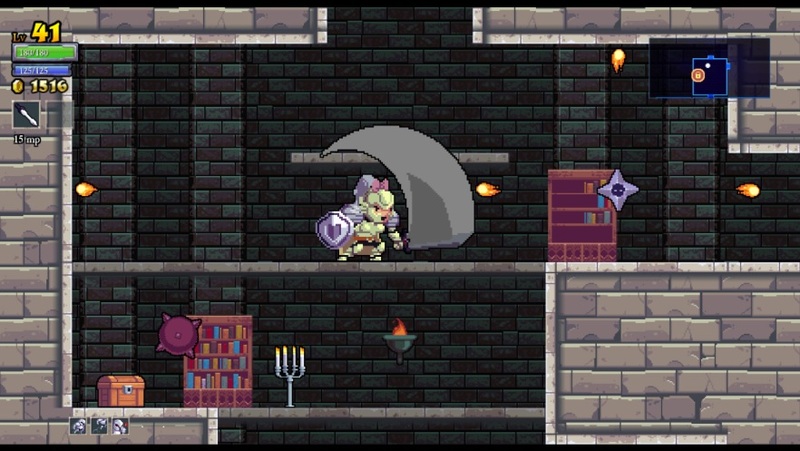 I found the Silver Cape in a brutal room in the tower, had to climb upwards with projectiles raining down from above. I died in idiotic fashion clearing the last part of the tower, really poor play. Unlocks went into a ton of stat bonuses since there was no new equipment to use. 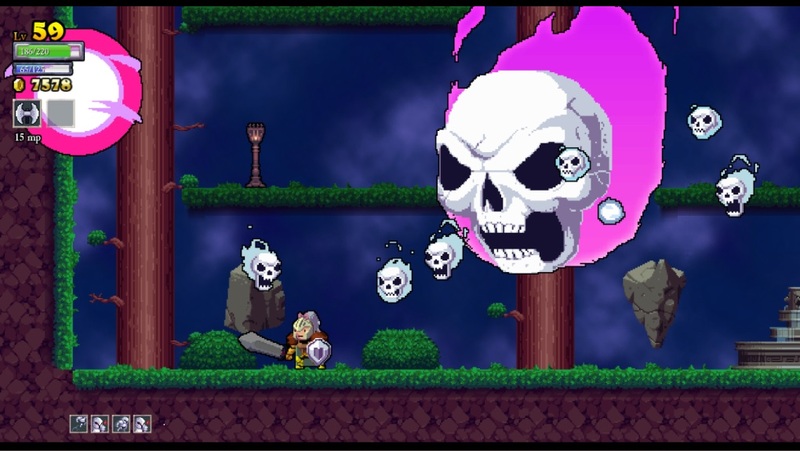 Hypergonadism (more knockback on enemies) and P.A.D. For this character, I just wanted to clear as much of the overall dungeon as possible. I found a Balance Rune and a Sky Rune early on in "defeat the enemies" rooms in the castle. As usual for this stage of the game, I did the tower section first, leaving the easier areas to restore health with Vampirism later. Found the Guardian Helm up there, a nice pickup. Then I found Sky Bracers and Ranger Helm shortly thereafter. What I really wanted was a Sword upgrade, as I had been using the Knight Sword for ages now. 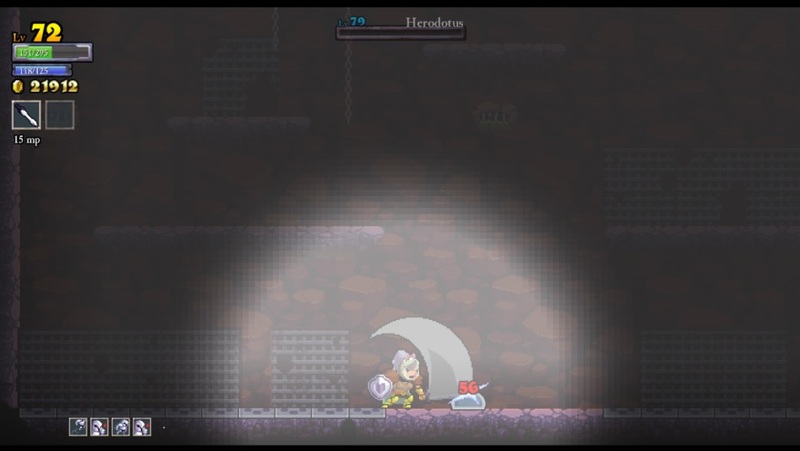 This was the first Paladin character to venture down into the basement area, and I found the Guardian Cape there early on. The Sky Chestplate popped up next to the basement boss door, and the Retribution Chestplate was in the chest literally next to it. Quite a run for equipment! This was my first Paladin to get a full dungeon clear, all four areas completed. One last battle for a fairy chest (which yielded a Haste Rune) in the back end of the basement required three different attempts before it finally went down. I had full health after clearing out the basement, and had extremely good traits for fighting Heredotus (PAD), so I went ahead and did the battle. 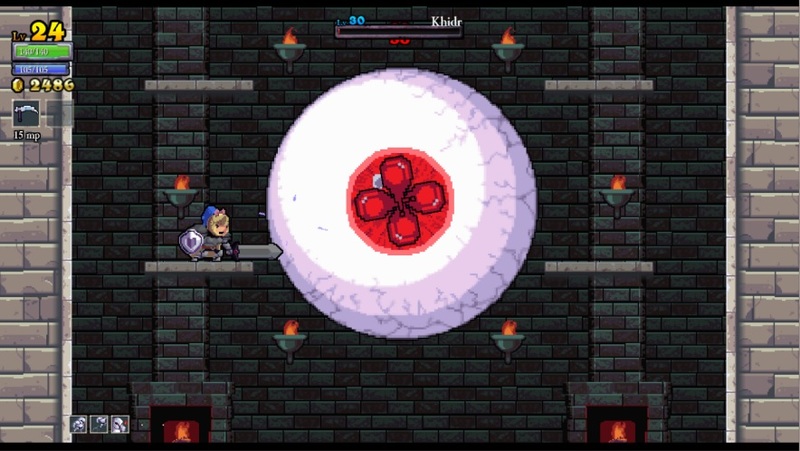 This is my favorite boss in Rogue Legacy, because the battle is heavily based on using the correct tactics. If you take your time and only kill the small bloblets and the little flying guys as they pop out, it's an easy boss to defeat. 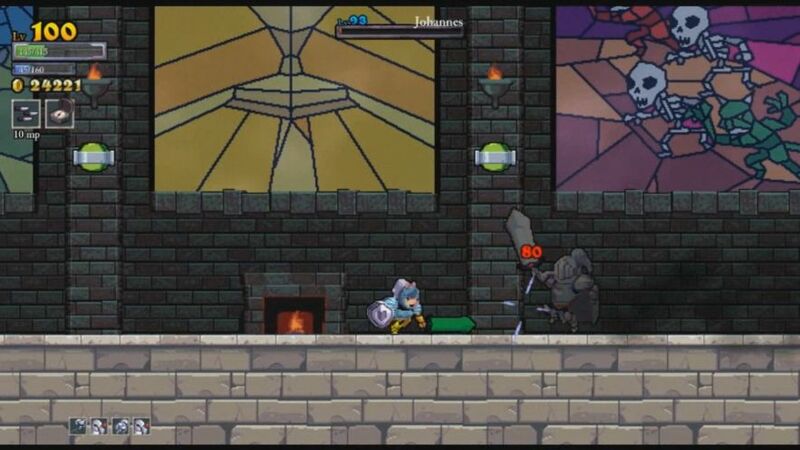 If you run around swinging your sword like crazy, you'll get overrun with the bloblets and swiftly killed. I had no real problems winning, and did so with plenty of health remaining. The reward was two Armor Up bonuses and a Magic Damage Up bonus. 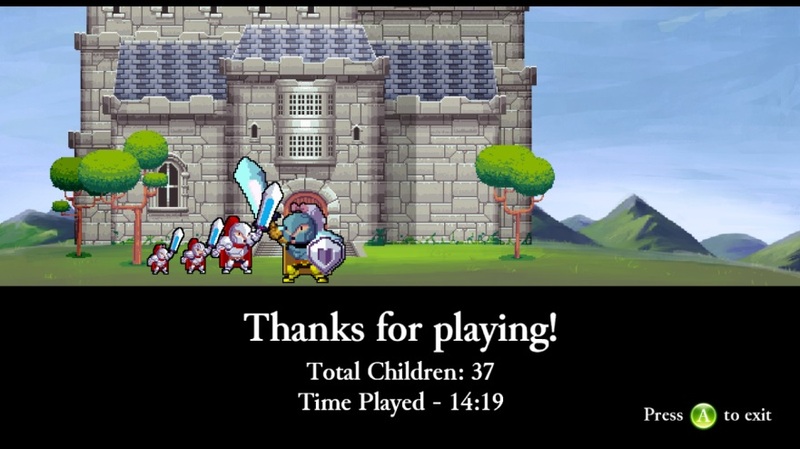 Note that I cleared the fourth boss before the third boss, and yes, that's perfectly doable in Rogue Legacy. I enjoy games with that kind of player freedom. Died to Ponce De Leon (third boss) since it had to be attempted without full health and mana. The 31k gold earned went into using the new equipment and then a bunch of strength, armor, and health upgrades. Great run! The Sage Sword also dropped later in the tower; when it rains, it pours. I found a Vault Rune and Sprint Rune in the castle, and a Grace Rune in the basement a bit later. I also found the Sky Helm, Retribution Cape, and Retribution Bracers in the basement, still a lot of equipment to pick up down there. Finally, there was a Health Up hidden in the last chest that I opened in the basement. Another full dungeon clear and 25k gold run. With nowhere else to go, it was time to face Ponce de Leon. I didn't play this battle very well and took a lot of unnecessary hits. Poor usage of the Paladin shield in this battle. 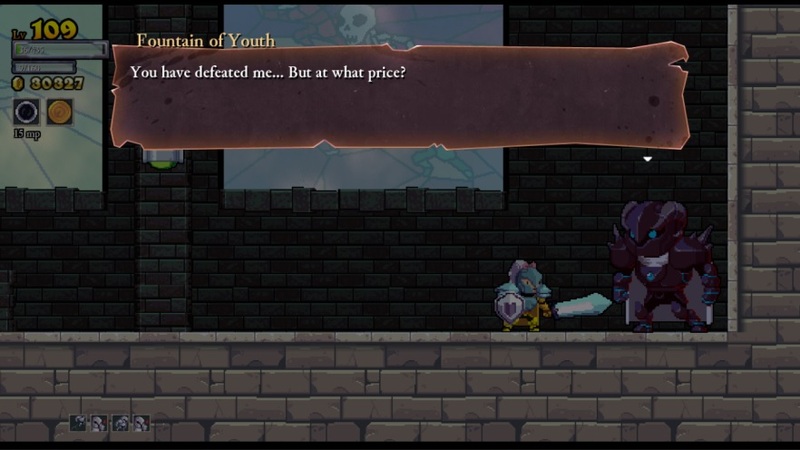 Fortunately, I had just enough health and damage to squeeze out a victory on my last hit. No chance to take pictures during the fight, I took this one as the boss was dying. The reward was two MP Up and one Magic Damage Up increases, blah. Not helpful for this character, not really. With low health and all of the dungeon's resources exhausted, this character had zero chance against Johannes, the final boss. I dumped the gold into the equipment that I wanted, and then another bunch of stat upgrades. Ended up with exactly 5 gold left over, hah! No traits. This is the game that was played on YouTube, it can be found at the following link for the curious. The main highlight was finding the Sky Sword, in the process of doing a full castle clear, along with killing two of the castle minibosses for stat upgrades. I killed Johannes in the last boss battle, but was unable to defeat the Fountain, largely because I played the encounter poorly. 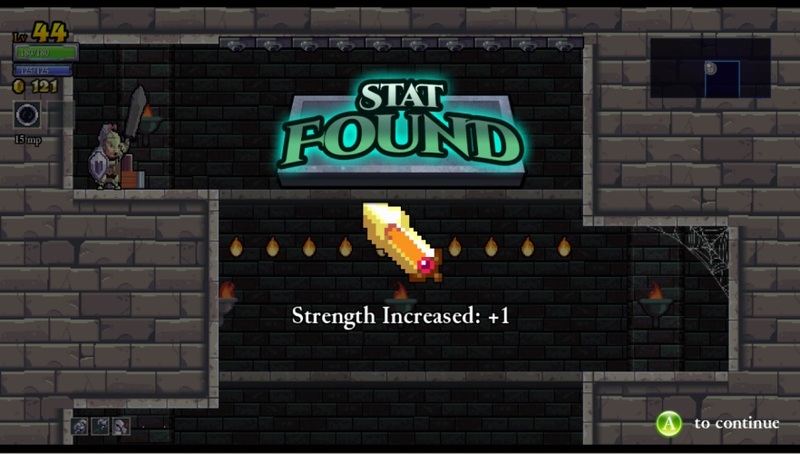 The unlocks went into using the new sword and then a ton of more stats. Savant, Endomorph. The Savant trait causes your character to get a different spell every time you cast one (axe, knife, chakram, etc.) Very unpredictable. 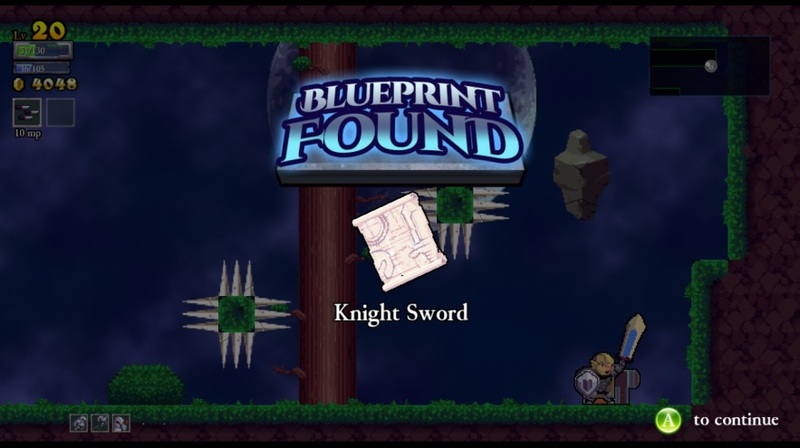 The belated run on swords continued as I found the Guardian Sword in the tower, outdated at this point unfortunately. I fought the duo skeleton miniboss twice, once in the castle and once in the tower, the second time yielding up the Sage Cape. Then I fought the same skeleton miniboss a THIRD time in the forest, this time for the Sage Chestplate. Holy cow! Interesting RNG stuff. This character had little trouble in full clearing the whole dungeon, resulting in the usual ~30k gold run. Found a ton of runes on this clear, about five in all, but none of them proved useful. There was nothing else to do at this point other than fight the end boss. The Johannes fight went very well indeed, killing him with over 50% life remaining. I was able to save one of the four chickens that spawn upon his defeat for later in the Fountain battle. This last duel was very intense, and I played it far better than on the last attempt. I was eventually knocked down to 30 HP, with the next hit meaning certain death, only to deliver the final blow to the Fountain and finish him off first, ha! I could not stop to take a picture until after it was over. Great fight. 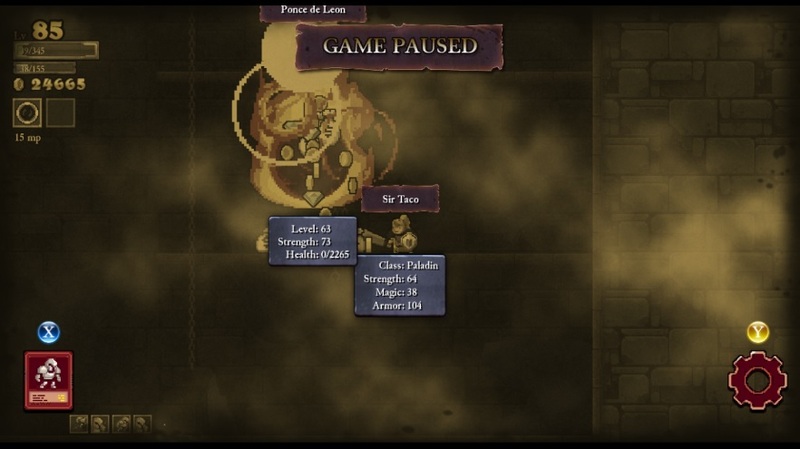 I ended up defeating the dungeon on the 21st Paladin character, although of course the endgame screen displays all the poor heirs who had to be sacrificed when they rolled other character classes. I really wish that this game had an option to pick one class and stick with that for the whole game, as a side option. Maybe if the tiny development team that made this game ever expands it and does a sequel down the road. 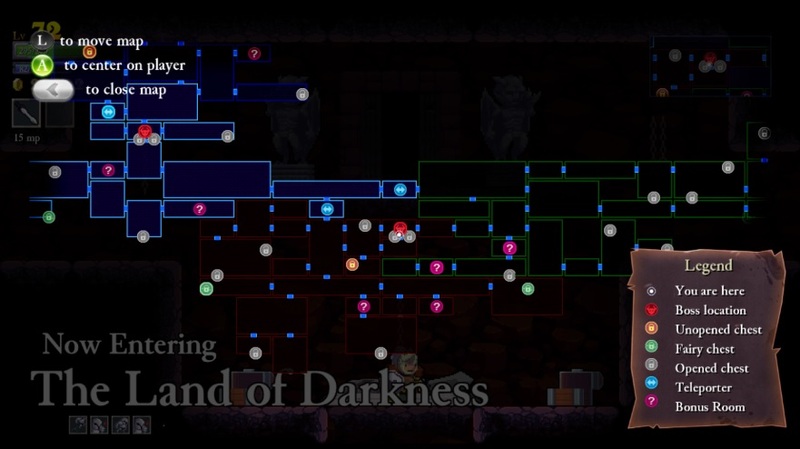 That covered the first trip through the dungeon, Rogue Legacy's version of "Normal" difficulty. However, beating the game unlocks the option to play out another quest in New Game Plus mode, this title's version of "Nightmare" (and eventually "Hell") difficulty. I intended to take each character class through at least New Game Plus for a second trip, and see how they fared on the second level of challenge. Onward to the next quest!